These days, it seems like talk of “the cloud”, “cloud aware”, “cloud ready” and a host of other meteorological-related messaging has become omnipresent. Just about everything has some cloud moniker slapped onto it, whether it might really deserve it or not. Despite this, the fact is that customers are more tech savvy and demanding than ever. Their attitudes about how they acquire and utilize technology and services are changing dramatically. Traditional IT organizations are not well equipped to deal with this shift. This shift can also be seen among those who are advocates of IT Service Management (ITSM). 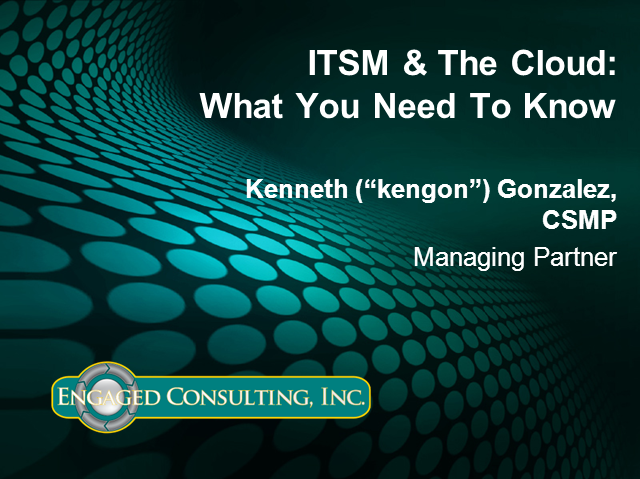 There are lingering questions and doubts about whether or not ITSM as a practice is relevant in a “cloud-based world”. If it is relevant, why? How? What do we do now? The underlying uncertainty here is further fueled by customer demands, contradictory definitions of what cloud is/means, commentary in trade journals, analyst reports and vendor marketing. During this session we will directly address the value and proper fit of a Service Management initiative with the adoption and use of cloud-based technologies. We will go beyond the “common sense” connections and identify the key elements that you need to attend to have your team and organization be successful. Kenneth Gonzalez, Engaged Consulting, Inc. Presented by: Kenneth Gonzalez, Engaged Consulting, Inc.